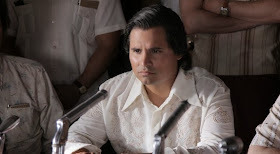 The long-awaited trailed for Cesar Chavez is finally here and looks to be a role that star Michael Peña will leave a powerful impression on. Peña plays the title character, based on the true story of the Mexican-American activist who led the Delano grape strike in the 1960s that lasted five years and he helped fight for the rights of farms workers. Chavez earned the support of Robert Kennedy when he went on a 25-day hunger strike in 1968. You can check out the first trailer for the movie below! The film also stars America Ferrera, Rosario Dawson, John Malkovich, Gabriel Mann, and Jacob Vargas and is directed by Diego Luna. It's set to hit theaters March 28.